Some people might tell you that Spanish and Greek are two totally different languages. But to us they’re nearly identical in one important respect: we understand very little of either. So with a shrug we hefted our bags and set off in the direction of the bus driver’s outstretched finger. A light rain fell as we made our way in this new and unfamiliar city. It wasn’t long until we saw the crowds. And then the barricades blocking our way. It turns out we had arrived the same day that 3,000 runners, and countless more spectators, had also descended on the city for Segovia’s annual half marathon race. 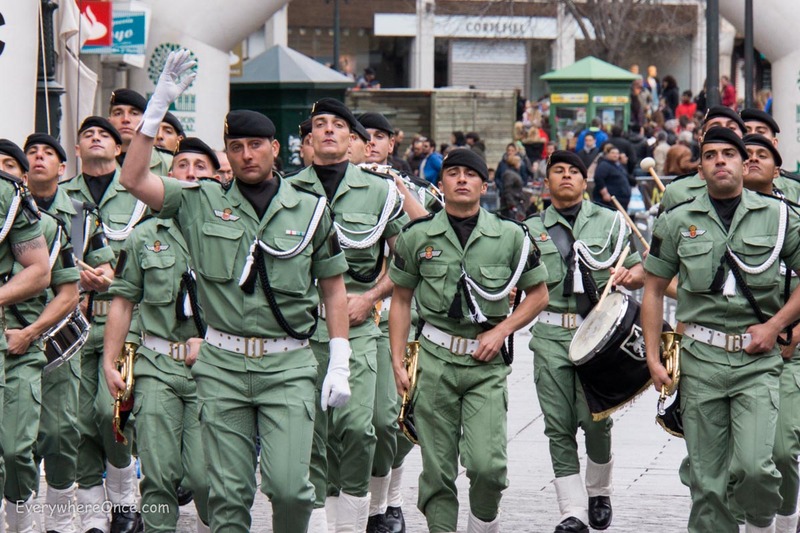 Marathon Day parades greeted us on our arrival in Segovia. Navigating the twisted canyon-like roads of a medieval city is typically challenging all on its own. It is doubly so when the streets are clogged with spectators, or roped off altogether. But there we were, not completely sure where we were going; stopped from moving forward, at any rate; laden with all our worldly possessions as the rain gradually worked its way through our coats; grinning like a couple of idiots. Segovia, we immediately recognized, is the kind of place your mind drifts to when it thinks of old Europe. Narrow cobblestone streets widen into pretty plazas. Some are filled with monuments and arched porticoes. Others, set high on the hillside, offer sweeping views of the surrounding countryside over expanses of terracotta tiled roofs. All are lined with cafés and tabernas whose patrons spill out into the streets to enjoy their beverages and soak up the atmosphere. Of course there is a castle perched imposingly on a cliff. 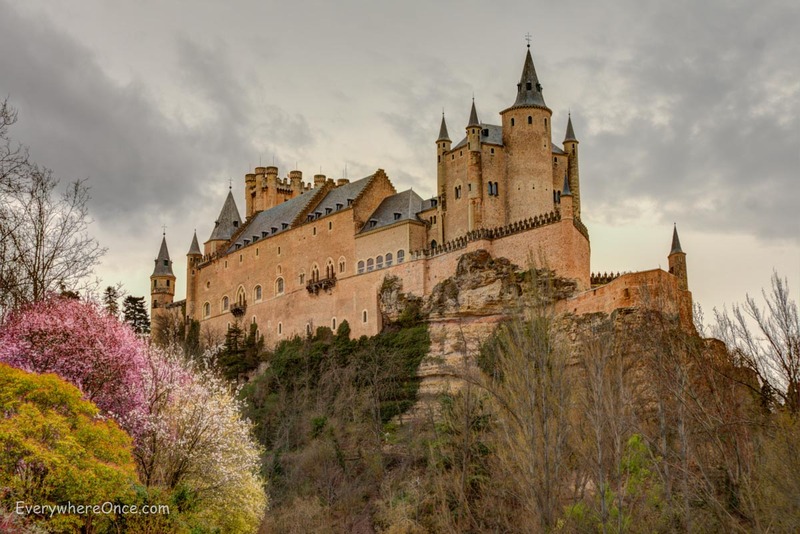 Like so many others, Segovia’s Alcazar is rumored to have inspired Walt Disney’s Cinderella Castle. The resemblance is difficult to see from within the city walls, but after a short hike down into the valley below the fairytale similarities become unmistakable. While the city’s Alcazar may command the high ground, its Cathedral cedes nothing to the royals in terms of grandeur and opulence. 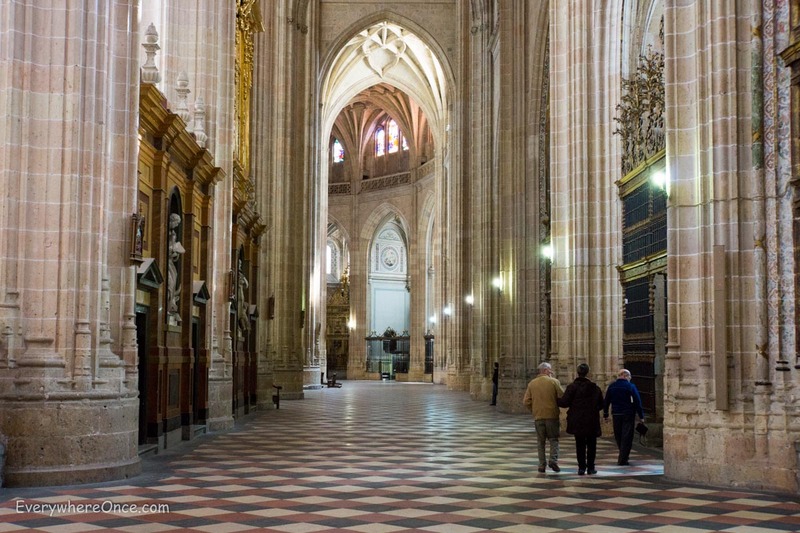 Reportedly the last Gothic Cathedral built in Spain, its vaulted dome is supported by a network of buttresses bristling with limestone spires. Stepping inside we were immediately overwhelmed by the vastness of the structure. A grove of granite pillars join together in arches 33 meters (100 feet) overhead. Surprisingly, none of this is what Segovia is most known for. That honor belongs to the city’s Roman Aqueduct. Situated in Plaza del Azoguejo at the foot of Segovia’s Old Town, the 1st century structure is commonly recognized as Spain’s most important Roman civilian engineering work. It’s a marvel to behold and incomprehensible to imagine that this artifact, constructed out of 25,000 granite blocks without the aid of mortar or cement to a height of 29 meters, has stood, through weather and war, for nearly 2,000 years. Like so much else in Segovia, it has to be seen to be believed. 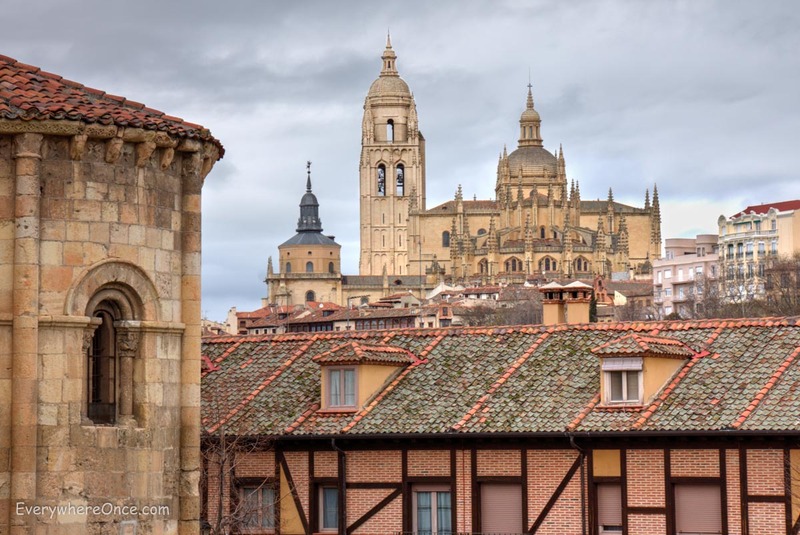 If you go: The high-speed AVE train from Madrid stops about 7 kilometers from the center of Segovia. The Number 11 bus will take you from directly outside the train station to the aqueduct in about 15 minutes (assuming there’s no marathon that day). Spain really is an amazing country. Your blog transports me to your location. I’ve very much enjoyed your descriptions of towns, cathedrals and more. Thank you for sharing your experiences and your great photos. 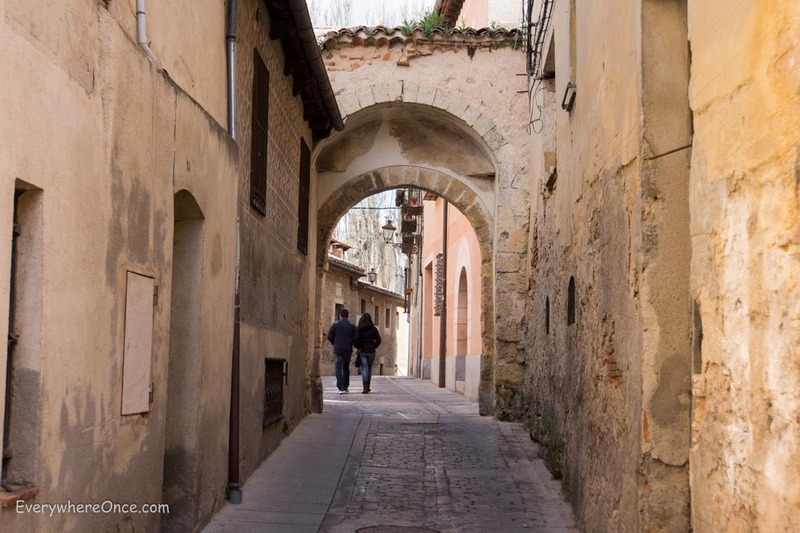 Great post…Segovia is on the list. I’ve spent quite a lot of time in Spain, but never been to Segovia. Next time, right?! I’m also a linguist so got caught on your comment about Spanish and Greek being very different…and indeed they are, though they are (distantly) related and actually have many similar sounds, so while I don’t understand Greek but do speak Spanish, if I hear Greek, it usually sounds like goobledigook in Spanish, which is fun! I have been in many areas of Spain, but never have heard of Segovia, and to me that doesn’t even sound Spanish! haha. glad you managed to have a great time despite the crowds. It was great to read this! I’m heading to Segovia in a couple of weekends! Bienvenido a Espana! Wow, those buildings are quite something! Aren’t they? We don’t really build stuff like this anymore.